Over the past two years I have done more posts about birch trees and using this beautiful natural resource than any other single topic. It is time to pull all of those posts together into an overview and add it to my themes page. Creating the theme pages is rather a time consuming bother but I find I use them over and over again. I think you would also find them useful. You can see the others I have completed by clicking on the Theme heading in the header navigation links above. But before you go exploring, take a minute to review my birch theme designed to pull together so many ideas into one place. I have mixed them up and put the inspirational ones first and then some of my projects last. The source information for all these photos is listed on the original page - so just click through for the complete listing. Birch Bark as a theme: - A collection of ideas and techniques for putting a birch pattern on your walls - decals, paint, wallpaper. 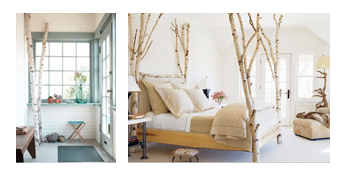 Birch Bonaza: A couple of ideas for incorporating birch trees into your decor - if you have the real thing. 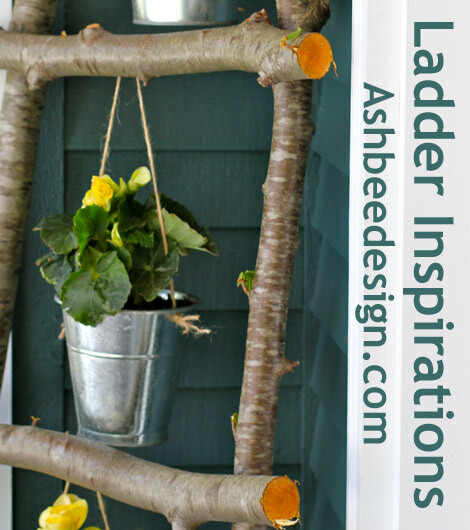 Simply a Birch Stick or Sticks: A collection of ideas for using smaller birch sticks and branches. Batik Birch Trees – I shared the work of artist Carolyn Doe. She uses batik to depict birch trees on fabric. Birch Trees in Quilts and Fiber Arts - I share the work of many different quilters and the wide range of compositions using birch trees in fiber arts. Birch Inspired Ceramics - There is a breadth of ideas for incorporating the birch theme in ceramics. Birch Update • Containers - As more birch ideas collected in my Pinterest folder I added an update showing more containers using birch bark. Update • More Birch Ideas - Here are a couple of kitchen utensils that I found simply stunning - in the birch theme of course. 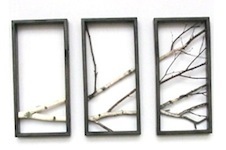 Birch Branch Triptych by John Oman - A post about the birch wall hangings created by John Oman. Harvesting Birch Bark for Crafts - A birch tree fell and I experimented with harvesting the bark. I shared my techniques and experiences in this post. 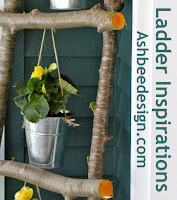 Birch Trees • Using a Windfall - Photos of how I used another fallen birch tree to dress up my front entry. 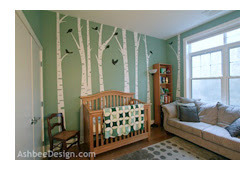 Birch Tree Nursery - A post about the nursery my daughter created for my granddaughter after being inspired by my blog. 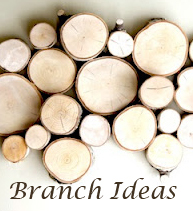 Branches • Birch Centerpiece - Tutorial on creating a birch fence centerpiece from birch sticks. Want to keep up with my continued interest in birch ideas? 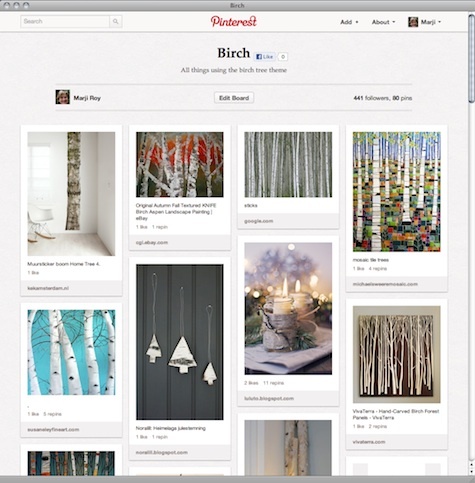 Follow my Birch board on Pinterest. Here is a button for you to pin to easily return to this collection of ideas and inspirations. Fun ideas. Everything we could want to create some beautiful and natural designs! Liz, You are right. And I've collected them together to serve as a resource to refer back to whenever I encountered a downed birch tree. Thanks for visiting and commenting. I love this theme!! So much inspiration. Thanks for linking up at Romance on a dime! !